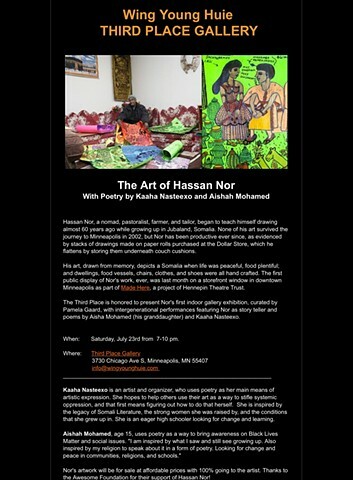 Pamela Gaard introduced the art of Hassan Nor to Wing Young Huie and advocated for him to exhibit his art to the public in Minneapolis, at Wing's Third Place Gallery in Summer of 2016. Adeer Nor’s drawings of utopia and abundance from his memories of home, along with Somali-Swedish writer, Awes Osman, reading in English and Somali from his latest novel ~ at Third Place Gallery, Minneapolis. Interpreters: Halwa Hussein and Ahmed Ismail Yusuf.